SAPPHIRE in Orlando this year was fun. Great to see that SAP acknowledges (more than ever) that integration is key. A new version of the CIO Guide for Integration (“Process and Data Integration in Hybrid Landscapes“) was also released last week which covers recommendations how to best integrate SAP and Non-SAP solutions. …is really big and the adoption is great (mainly driven by CPI customers) already today. There was also an announcement about a partnership with Cloud Elements, a company which allows to consume the APIs of various Non-SAP solutions. It will be made available under the name SAP Cloud Platform Open Connectors in Q3 (pricing not clear yet). This means, customers can then start using the APIs directly, but also from CPI (via HTTP/OData Adapter). …is the new umbrella (it is not a product itself) to address integration topics. It contains all strategic technology components to integrate data and processes. 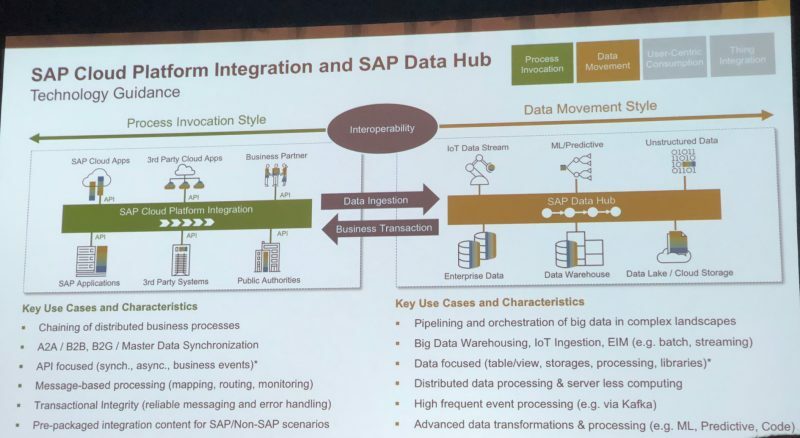 Again: It means, integration through data exchange remains, but integration through data sharing will be also possible (mainly using pipelines in SAP Data Hub). Basically you can leave large amounts of data where they are (e.g. IoT data coming from sensors in Hadoop) and access them remotely without the need to replicate them into HANA (and pay for the high memory need). The SAP middleware to be used is mainly SAP CPI, although a lot of SAP-internal integration takes places internally, either via SAP Landscape Transformation Replication Server (SLT) or SOAP-calls and using SAP Application Interface Framework (AIF). AIF is now integrated into the S/4HANA licenses (Cloud & On-Premise) at no additional cost. And… SAP PI/PO is still supported and a valid option. Standard Integrations can be found in the SAP Best Practices Explorer: Select SAP S/4HANA -> Cloud -> SAP Best Practices for SAP S/4HANA Cloud‎ and then select scope item group “SAP S/4HANA Cloud Integration”. Bottom line: Good to know what is possible and where to find it. It helps already a lot for scoping with regards to interfaces and integration.